It is generally perceived that front-wheel-drive cars - that is, cars in which the front wheels do both, put power to the road and steer - are understeering wrecks that fly off the road if you go into a corner too quickly. This is generally true, but it is possible to eliminate understeer and actually oversteer to a certain degree. Oversteering fun is not just the domain of rear-wheel-drivers. Oversteer is best practiced in an open area, and preferably on gravel so you can lose traction without much effort. You will not be able to hold a long, continuous sideways drift around a sweeping corner with a front-wheel-drive car like you can with a rear-wheel-drive vehicle, and you cannot use engine power on a high-horsepower car to start a "powerslide" since the power acts on the front wheels. But still, contrary to popular belief, oversteer is possible with a front-driver. WMV format / 203kb / 6 sec. One way to induce oversteer in your front-driver is to plow hard into a corner and then lift off the throttle in the middle of the corner. Lifting off the throttle will cause the weight of the car to "shift" to the front, thereby putting more weight over the front wheels and, ultimately, adding more grip to the front tires. However, if you are lucky, the rear tires will lose traction and start to slide outwards while you're turning. You are now oversteering. Some countersteer now has to be applied to keep control of the slide, that is, steer in the direction of the slide. Learning to precisely "catch" a slide will take a lot of practice, so it is better to play around in an empty gravel lot or a slippery track with large run-off areas. Start off at moderate corner entry speeds and then increase this speed as you become more confident. This technique is only possible with well-balanced front-drivers such as an Integra or an old Sentra SE-R. 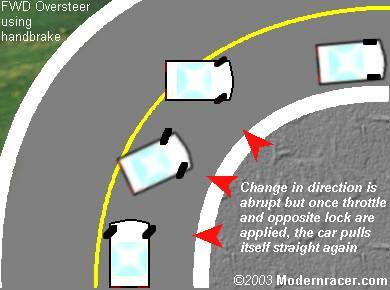 If your car can achieve oversteer in this way, you will generally be cornering faster. Practice with lower entry speeds, and gradually increase it as you get confident. WMV format / 158kb / 4 sec. A brute-force way to induce a slide is to pull the handbrake (or press the e-brake) momentarily and yank the steering wheel in the direction of the corner, then countersteer. For example, to take a right-curving corner, you could plow into the corner in second gear and as soon as the corner starts, yank the steering wheel to the right and a split second later, pull the handbrake. The rear wheels will lock and suddenly lose traction. The car will quickly go it a sideways skid, at which point you quickly start countersteering. Now, before exiting the corner, release the handbrake. The front wheels of the car will just try to pull the car straight again and you'll have to steer exactly where you want to go. If you don't release the handbrake in time, you will spin. If done right, eventually you will center the wheel and straighten the car. Throughout the turn, keep the accelerator at a constant position, but you can apply a litle more throttle on the exit if you think you are spinning out. One hand should always be on the handbrake, with the button depressed, so you will have to turn with one hand. The sudden slide is a little hard to control on the first few tries and requires quick reflexes. And, as stated earlier, a continuous slide around the whole corner, like those done with rear-wheel-drive cars, is not possible with a front-driver. Pulling the handbrake to turn around a long radius corner will actually worsen your cornering time in most cases, so it is not a technique for road racing. But it can save you if speeding and understeering off a cliff is eminent. Most cars on the road today are front-wheel-drive cars, from Acura to Volvo. The only rear-wheel-drive cars available nowadays are either impractical roadsters, exotic sports cars or overweight luxury cars. There are a number of well-balanced front-wheel-drive cars available that are actually easy to drive fast around corners. Examples include the RSX Type-S and legendary Integra Type-R from Acura, Celica GT-S from Toyota, SVT Focus from Ford, Sentra SE-R from Nissan, and the new Mini Cooper. Do note that not all front-wheel-drive cars are suitable for oversteering. 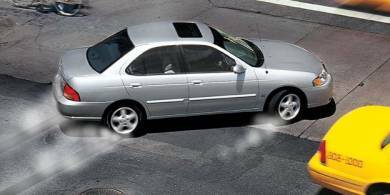 Many cars, like the Infiniti G20 and Chevy Monte Carlo, are set up to understeer, sometimes aggressively so, because understeer is generally easier to control than oversteer for inexperienced motorists. The methods described here only serve as a general guide and will have to be adjusted according to the car you drive. There are other techniques too, such as left-foot braking and the pendulum drift, but these are harder and require their own space for discussion. On a cautionary note, sliding a car not set up with substantial bracing might cause your car to fall apart! Practice on gravel, grass or in the rain, in an open area. Then adapt your car and your driving to handle the tarmac.